Necessity is the mother of invention. Occasionally it is the mother of deliciousness as well. Like when you decide last minute to invite your father-in-law over for dinner & haven’t gone grocery shopping in a long time. My father-in-law is definitely more of a seafood person than a meat person, so with that in mind I opened the freezer & took a look. Shrimp; check. I almost always have shrimp, thanks to Winn Dixie’s BOGOs. Shrimp is great for pasta, which is a pantry staple, but what else can I put in it? Mixed veggies with corn; perfect! 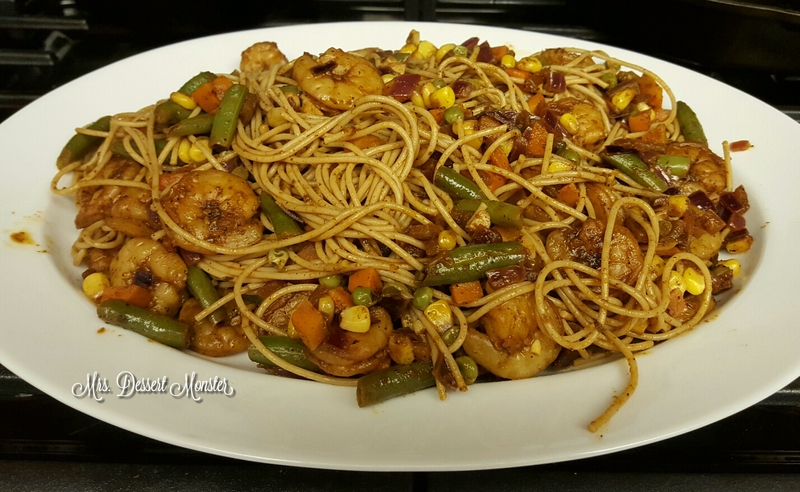 Suddenly I was inspired to create a Cajun-ish, spicy style shrimp & corn pasta dish. 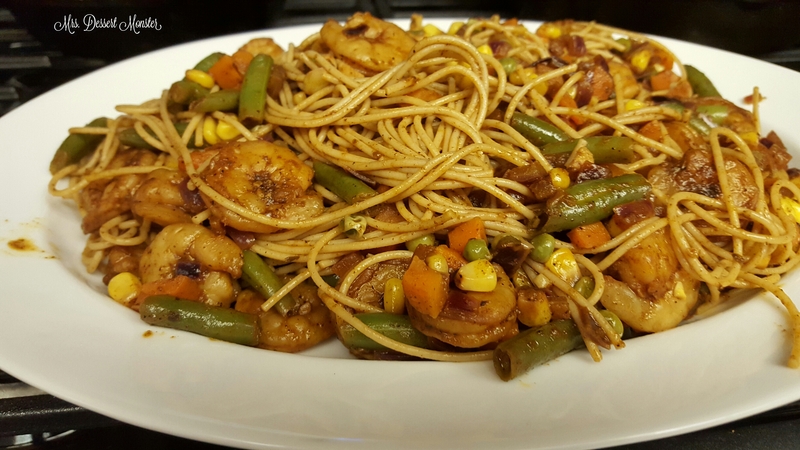 I figured the spicy blackened shrimp would go nicely with the sweet corn – & I was right! The mixed veggies blend I used worked pretty well for the recipe, but next time I will add more corn! The dish came out pretty spicy. I added a little bit too much blackening to mine, so I cut it back in the recipe below. That should bring out the other flavors a little more. This recipe can feed up to 4 people. The 3 of us ate generous portions & there was just enough left over for me to take to work tomorrow! Cook spaghetti according to package instructions. Drain and set aside. 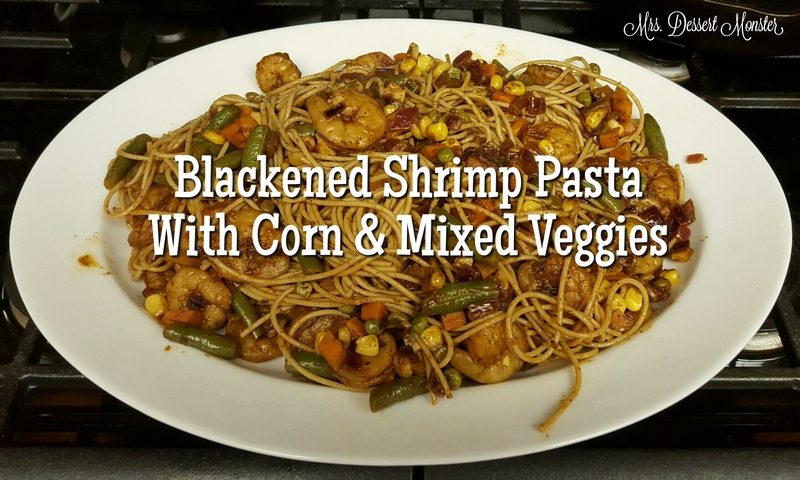 Combine shrimp & blackening seasoning, & cook in a pan with olive oil until shrimp turn pink. Remove shrimp from pan & set aside. In the same pan, sautee garlic & onion in olive oil for 5 minutes. Then add frozen veggies & white wine to the pan. Cook until liquid has reduced by half. Add shrimp back to pan. Cook for 2 minutes. Pour the entire contents of the pan over the spaghetti & toss. This sounds awesome! I can’t eat shrimp, but could maybe sub some fish or chicken? Thanks 🙂 Definitely! Blackened chicken would go great!